Lighted Boat Parade committee members presented checks to community organizations this morning. 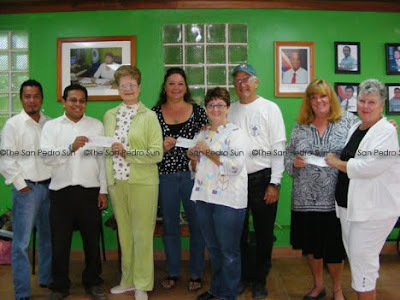 Donations were handed out to the San Pedro AIDS Commission in the sum of $1,500 while Holy Cross Anglican School and the Calendar Girls committee received $750 each. The donations were made possible by the Boat Parade committee based on monies remaining after all the bills had been paid. “It is a way of giving back to the community that made this year’s Boat Parade a success,” commented Chairlady of the committee Jan Brown.